Casual, mostly personal thoughts from Oliver. Cady handles family medical emergency with aplomb! Last night, while Cady and Amelia were preparing an elaborate dinner and dessert alone in the house, Amelia collapsed, unconscious. 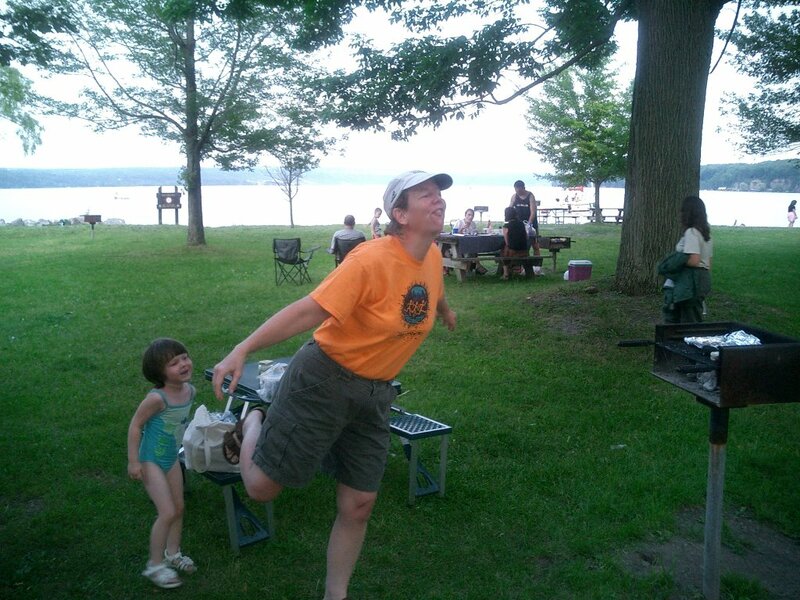 Cady tried catching Mom, but alas, the size and weight of an adult is a bit too much for a 9-year-old to catch! Cady sprinted from the room, looked back from the dining room, screamed, then cried. Rapidly composing herself, she hurried through the living room to get to the phone because Mom's body blocked the shorter route through the kitchen. Cady picked up the phone and dialed 911. She answered all their questions, and hung up after they hung up. She then looked up Talia and Haim's phone number (parents of her friend, Abigail) in the school directory and called them, speaking to Talia, who sent Haim immediately to our house in their car. Then Cady heard the oven beeping, so she turned it off. Next, she went to Mom and felt for her heart beat, but couldn't find it. 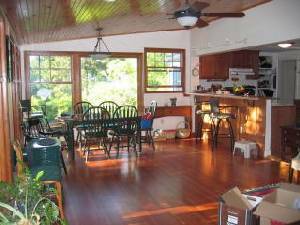 So, she listened and heard her breathing, which seemed OK.
After all this, Cady unlocked the front door, opened and left it wide open, and put on the outside porch light. Haim then arrived, followed by his son, Edan. Cady watched Mom leave in the ambulance, then Cady walked with Edan to his house for the night. 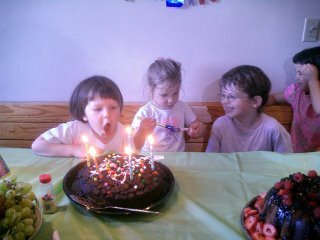 Cady prepares to blow out her five candles, as Peter looks on. Eastlake's ball pit entertained the kids for most of the party, at which we celebrated two birthdays in addition to Cady's, all ECC friends. Now that Cady has entered kindergarten, when will she next get together with these friends, most of whom go to different schools in Ithaca? 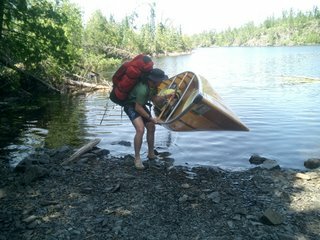 (Left) I'm starting off on a portage with our super-light rental kevlar canoe. (Right) Tom, Dan, and me floating along. 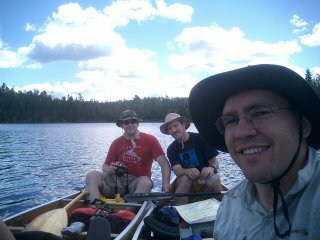 Our trip to Minnesota's Boundary Water Canoe Area this August was a gift from Amelia and her sister, Aunt Laura, to Dan and me. Tom (Amelia's nephew) and his cousin Mike were our very capable guides. Super time, great weather, and a truly special place! A couple years ago Glenn Swan recommended to us the Pedro's Pretige bicycle pump and we have been very happy with it. Easy-to-use Presta/ Shrader valve and excellent gauge complement this sturdy metal pump. Bought locally in Ithaca at Swan's Cycles (directions) for $28 about two years ago. EMS currently sells it for $45. Kevin Kelly's Cool Tools, which is loaded with good recommendations for tools like this, doesn't seem to have a bicycle pump listed- just the Fix-A-Flat product. Amelia's 40th birthday was July 3rd, and we celebrated a third time on Saturday, July 8th, this time at Taughannock Park. Here, Amelia is giving us her famous swan statue pose, complete with water springing forth from between her teeth. Cady did a pretty good reproduction herself. 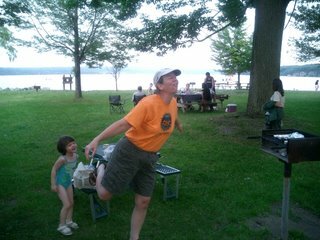 Amelia and two of her sisters (with families in tow) convened at the Habicht's Camp Kemah on Kezar Lake, Maine (near Conway, New Hampshire) last week, where we had one of "Amelia turning 40!" celebrations. In this picture, at the Triathlon's starting line were (l to r) Anna, Cady, Oliver, Amelia, John, Dan and Laura. Kevin joined Cady as a spectator, along with photographer and record-keeper Joyce. [Ellis and Tom Neufeld were in Alaska that week.] We had teamed canoe paddling instead of biking for this fun event. During our stay in Maine, Dan and Laura's van got totalled (no one hurt, thankfully), so they ended up driving home in a new car. Joyce's car was not as badly damaged, but the bikes it was carrying were. 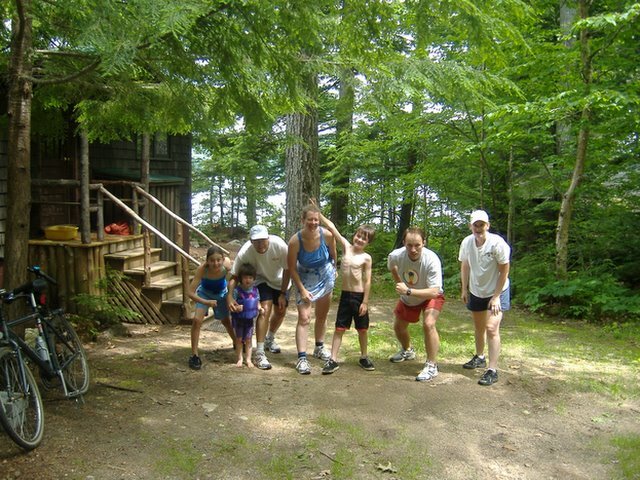 More Camp photos in our Picasa Web Albums. Carving out a spooky Halloween night! Habicht's photo album web site. Oliver B. Habicht's personal blog.